Marc looks for opportunities to share the story of his life. 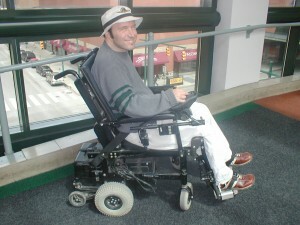 He puts the word “power” in power wheelchair. You have to jog to keep up with Marc when he’s enjoying himself out on the town. Similarly, Marc works at full speed and is a mover and a shaker in his professional career. He is currently working towards his masters degree in social work while working as an advocate for senior citizens. At home, Marc enjoys a slower pace and long naps in the sun. He is addicted to Carey’s cooking but not a fan of rice (no matter how it is prepared). Marc is quirky and lighthearted and not afraid to admit that he enjoys a great chic flick from time to time. He’s also a sucker for a good mob film. You can read more about Marc by clicking on links in the menu.